I was pleasantly surprised when my friend Niels at Shibumi asked if he could send me a little "Christmas gift" last week. 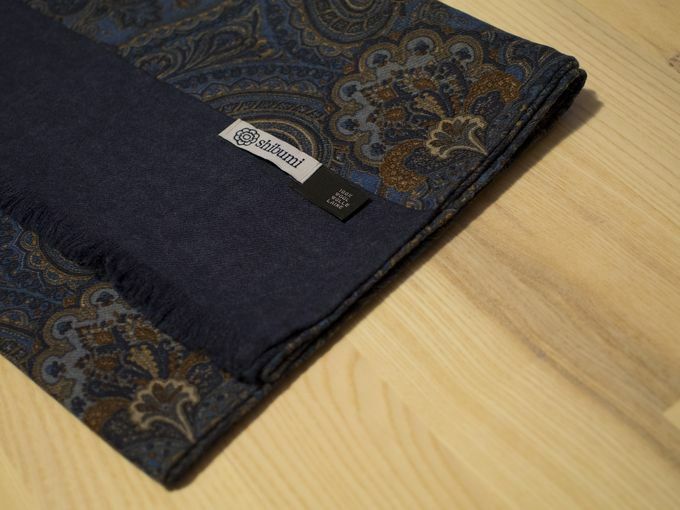 Having been very satisfied with my previous Shibumi Berlin products I gladly agreed. What I got was a printed wool scarf and a printed wool tie, the first one in a blue/rust color and the second one in navy/sky blue/olive. Here's both of them in detail and with some initial thoughts. I'll be adding a few more pictures later on once I have the chance to photograph them in daylight. 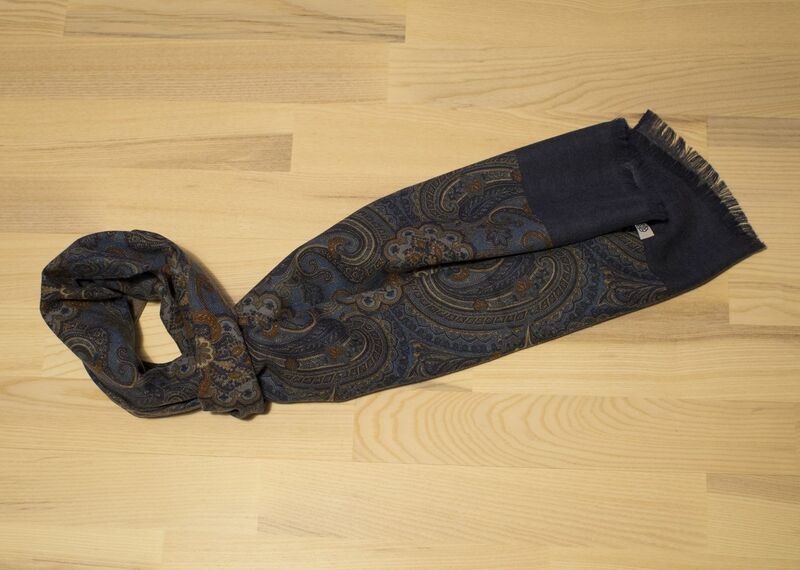 The German-made scarf has a very sharp print and great colors. The difference in the print job is big when compared to a similar scarf I have from SuitSupply. The edges are a lot sharper and more accurately printed giving the scarf a lot more refined look. The fabric feels lightweight, but thicker than many printed scarves I've seen and touched. 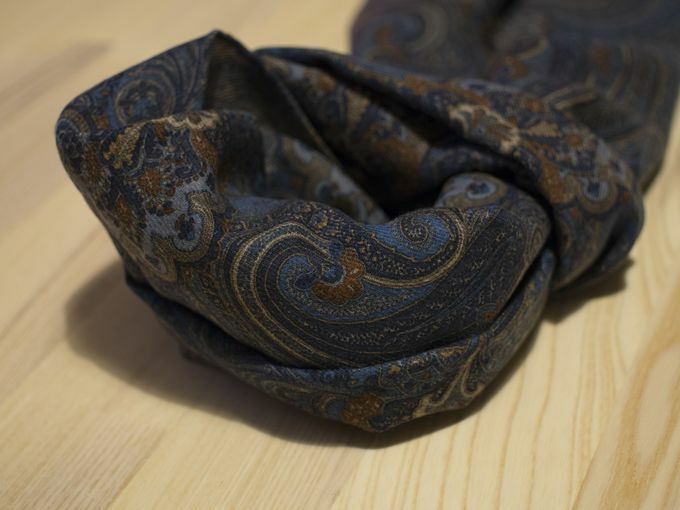 Overall this is a very beautiful item and makes a great companion for a suit or a sport coat. 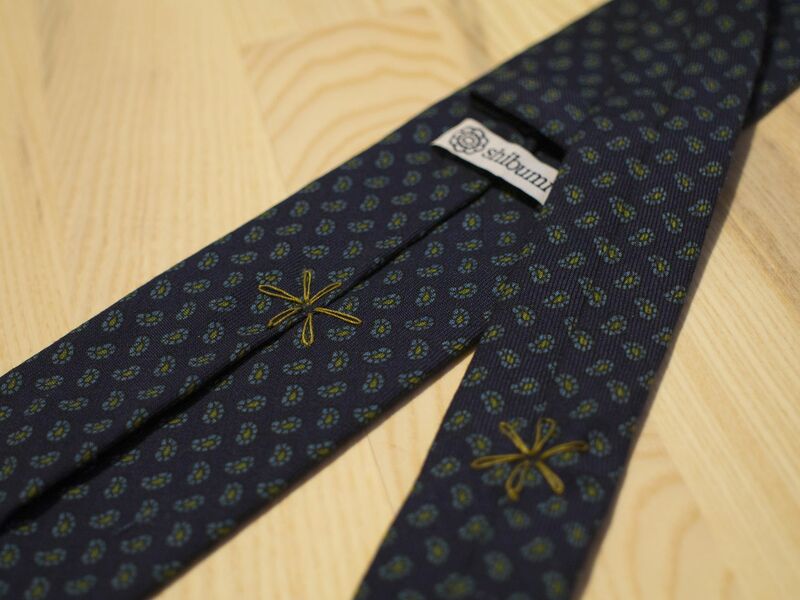 Then the handprinted wool tie. It has a same kind of lightweight construction and feel than my grenadine ties had, something that I truly loved about them. 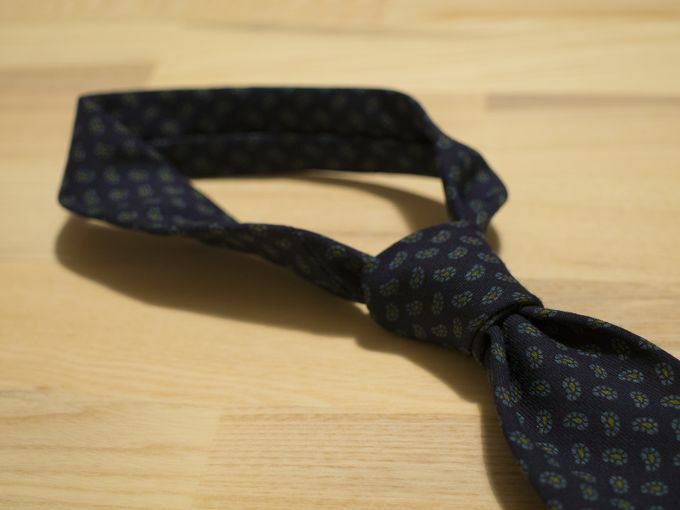 It ties a beautiful knot and in my opinion has really just the perfect weight a tie should have. It's handrolled and has the beautiful signature floral stitching on the backside. 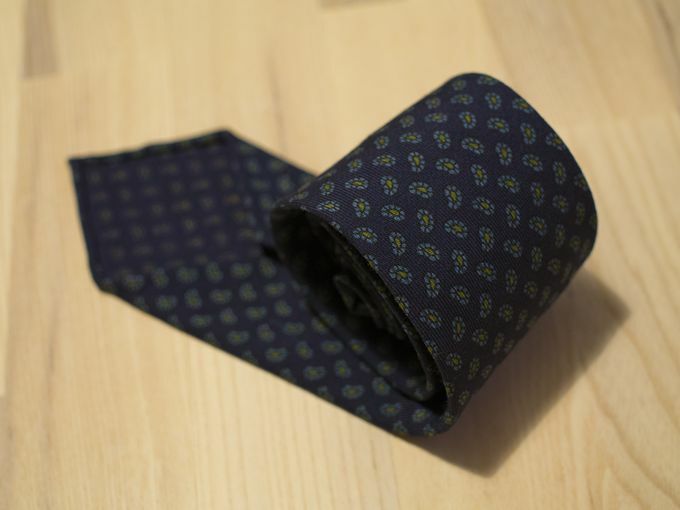 The tie is made in England with traditional handprinting techniques, and it has to be said the print is sharp and comes with great colors. That said, I find the navy/sky blue/olive (that kind of looks like a mustard yellow, this is a tough call to be honest) a somewhat challenging mix of colors to be not that versatile. A mid grey wool suit or perhaps a light grey wool flannel suit would be my choice to go with it, as I'm a little bit wary of how the sky blue/olive paisley would look with a navy suit/sport coat. In general I must say I'm really impressed with what Shibumi offers. Both grenadine ties I received earlier have been in active use and are one of my favorite ties, and I can see these two are going to see plenty of use in the winter months to come. 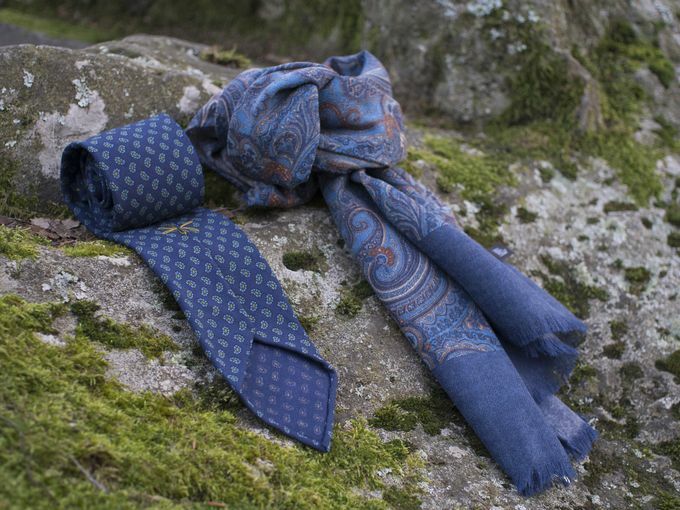 What really impresses me though is that I would say they've pretty much nailed it when comes to the weight of the fabrics, something that is extremely important in high end accessories such as ties. Now I only wish they brought more options on the table (I wanted that eggplant-colored zig zag knit tie that apparently is now sold out), would be interesting to see how they would make similarly lightweight linen ties for next summer. Update: An extra picture added to present the colors more accurately.